Like a lot of “found footage” type movies, it starts with a setup regarding who’s filming it and why. Seems around Norway there are a lot of deaths recently, all being attributed to bear attacks. The offending bears are always found post-death and seem to involve a grizzled old dude with a lot of equipment. Nobody knows who he is. So a group of college students hunt him down and follow him to try and get the story. After chasing him across the country, he finally relents. He’s a hunter, all right, but not of bears. They find this out the hard way when they catch him in the middle of a midnight raid. His prey: a building sized, pissed off, three headed troll. Now, this is where the movie could’ve immediately gotten ridiculous, considering the premise. And it would have been fun that way, too. However, the filmmakers do something rather genius, and treat it like it’s straight up fact. We even get explicit details about the nature of the trolls and all their different types, and even how they reproduce and die. As a result, the movie is still funny, but (despite the braying jackasses behind me in the theater) has a lot of heart behind the story. Not from the college students, as they’re fairly one dimensional. 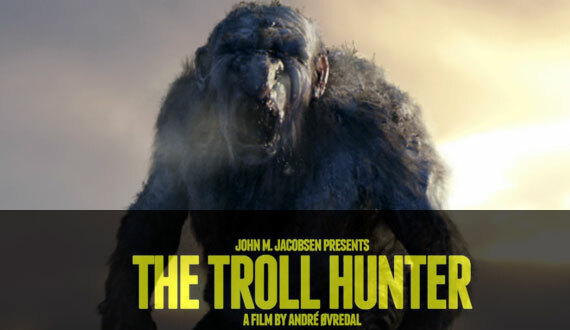 The troll hunter in question, though, has a lot of character to him. He’s tired, has no friends or family, and has a strangely sordid past that involves the trolls. We get to know him over the course of the film and he may not quite be the badass he seems to be in the beginning. The movie is also treated as reality when the ending is basically the footage getting cut off! We’re left with no real resolution with any of the characters…which does lead to one problem I had with the movie. There were a couple threads of story that never lead anywhere. The main one is one of the college students gets a bad scratch during a troll attack that ultimately ends up being pointless. Some minor dimness in an otherwise bright and fun movie! This entry was posted on May 4, 2011 at 3:24 pm. You can follow any responses to this entry through the RSS 2.0 feed. You can leave a response, or trackback from your own site.